For two weeks I'd been trying to get my instrument check ride out of the way, but each day I tried, the airplane du jour was so broken it couldn't be flown. 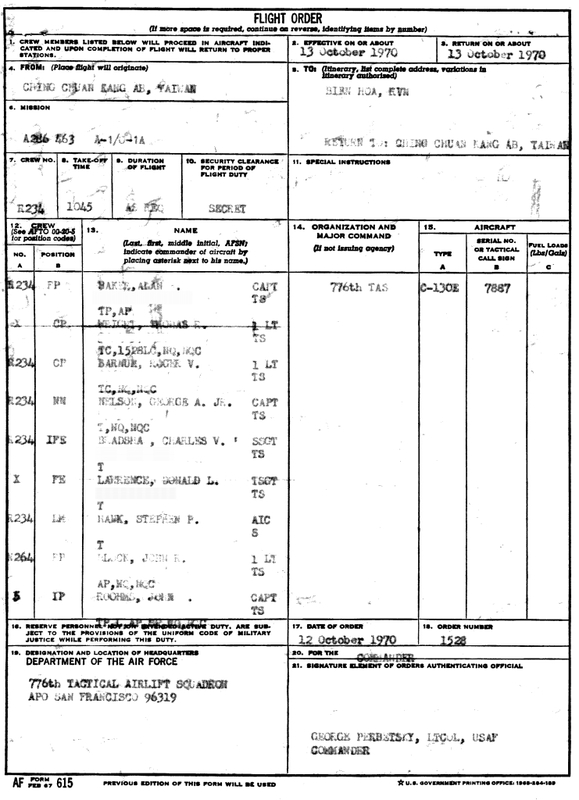 I was finally scheduled for a check flight on a round-trip to Vietnam--we called such a trip an "out-and-back". Our orders were to fly to Bien Hoa and return. In addition to being a check ride, it was my first trip as the aircraft commander and my first flight with my own crew, so I was pumped! The flight engineer was also getting a check ride, and after our previous mechanical problems we were paying especially close attention to the airplane's condition. The airplane checked out just fine so we cranked it up. We taxied out and the engineer brought the outboard engines up to normal ground idle, which sped up the airplane a bit. I applied the brakes to slow us down and nothing happened! I tried the brakes a second time and still got no braking. So I told the copilot to turn on the auxiliary hydraulic pump and select emergency brakes. Those worked! (If this had happened while we were landing on a short field we would have been in trouble.) We tried normal brakes again and they worked very erratically, so we switched back to emergency brakes and taxied back in. We picked up some maintenance guys and did a taxi check. This time the brakes worked just fine! We never found out what went wrong, but since everything was working again we pressed on out to the runway. 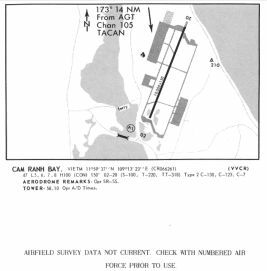 At CCK we were tenants on a Chinese airbase--that is Chinese as in Republic of China (Taiwan), not People's Republic of China (mainland). The military there was on a high state of alert, ready to go to war at any moment. Before we reached the runway, the Chinese scrambled their F-104's, and in a rush to take off, one taxied under our right wing! We were carrying 21 tons of fresh vegetables for the troops in Vietnam. To avoid refueling in Vietnam, we also carried enough fuel for the round-trip, 18 tons. At this heavy weight we made a very slow climbout and could only reach 18,000 feet--below the preferred altitude for this route. 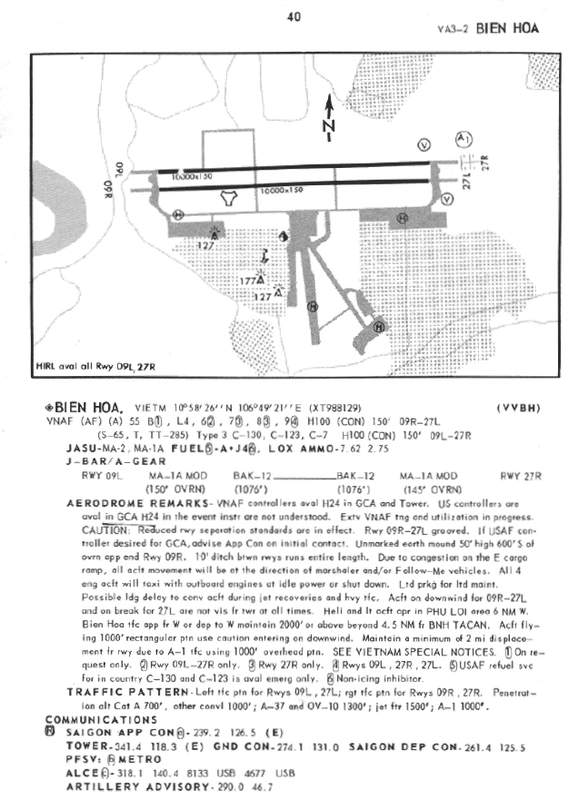 But the trip to Bien Hoa was uneventful and I made a really good GCA (ground-controlled radar approach) and a grease job landing. I hoped this impressed the check pilot. 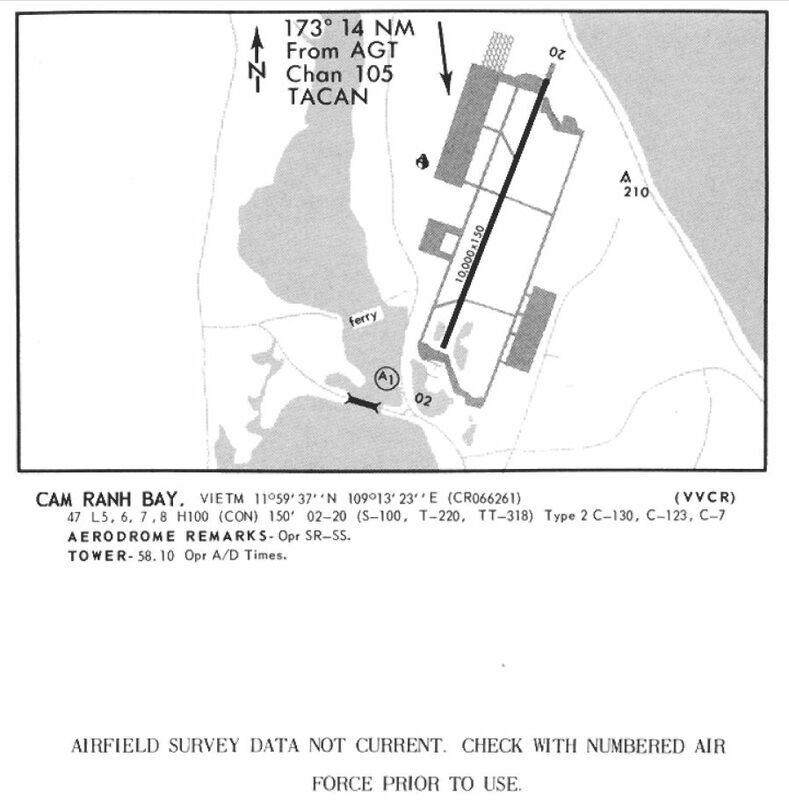 So we flew TAC VFR (visual flight rules in the clouds with radar flight-following) to Cam Ranh Bay, where I flew a very good VFR approach and landing. 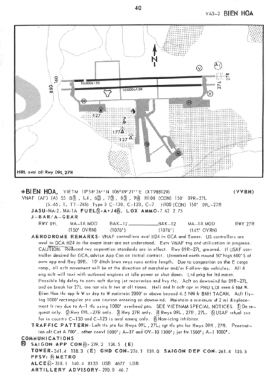 I filed a new flight plan to CCK because the original one was only good for returning directly from Bien Hoa. I made a disappointing ILS (instrument landing system) approach and landing at CCK. So after doing well all day long I ended my check ride on a down note. But at my check ride debriefing the flight examiner had only praise for my flying and my crew management. Hurray! It was a funny feeling to be flying south on W300 and be able to look out the window and see Red China. Other crew members log day and night VFR. Working out everything both horizontally and vertically is like a numerical crossword puzzle. Just for myself I logged 11 different kinds of flying time! 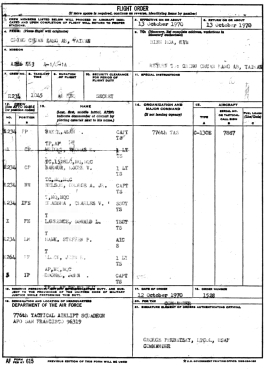 I signed off the forms so the crew chiefs could get their $65 combat pay and did up a complimentary writeup in the 781 (maintence form) because the crew chiefs were quite helpful and the airplane was well-maintained. Maintenance is such a negative job that I like to say so when somebody does a good job. Everybody writes up the bad jobs. Few write up the good jobs.